Petrie Riding boots are handmade by master craftsmen combining both traditional and modern techniques in order to produce boots of the highest quality. Petrie has a comprehensive range enabling you to choose from different styles, colors, leather finishes and additional options. Petrie boots can be made to your exact specification.Elegant and slim, the Petrie boot has a close fit around the ankle and the combination of the footbed and the Petrie (R) comfort insole results in a durable, high quality riding boot. The Petrie Juvenile Melbourne and Sydney boots are made from soft veneto leather with a full leather lining, 5cm top, lace-up fastening, rear zipper to the sole with an elasticated section to allow for calf growth (up to 2cm). 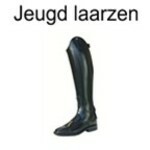 Petrie Melbourne Jeugd veterlaars met zweephouder in zwart lakleer+strass+zilveren "P"
New! The Petrie Juvenile boot Sydney is from soft Veneto leather with a full leather lining and 5cm top. The rear zipper has an adjacent elasticated section to allow for calf growth (up to 2cm). New! The Petrie Juvenile boot Sydney Extra is made from soft Veneto leather with a full leather lining and 5cm top. The rear zipper has an adjacent elasticated section to allow for calf growth (uo to 2cm). Please see the size chart below.